A day after the third and final Presidential debate, candidates Donald Trump and Hillary Clinton found themselves sitting at the same table separated by Cardinal Timothy Dolan, at the Al Smith Dinner - a traditional gala event where politicians bombard each other with comedy-roast-style humour directed at each other, amid uncomfortable laughter. Emceed by Alfred Smith IV, the gala white-tie event, also a charity dinner, was held at the Waldorf Astoria Hotel in New York City, and was attended by the likes of New York Mayor Bill De Blasio and former New York Mayor Rudy Giuliani. "Just goes to show you that if you were born into immense wealth or your husband was president, you can accomplish anything," Alfred Smith kicked off the event, setting the tone for the night. "It is historic that the Donald is here tonight. That's right, for the first time the Catholic Church is not the largest tax-exempt land owner here tonight," he said, cuing Republican Presidential candidate Donald Trump to make his speech. "You know, they say when you do this kind of event you always start out with a self-deprecating joke. Some people say this would be tough for me but, the truth is...The truth is, I'm a very modest person. In fact many people tell me that modesty is perhaps my best quality. Even better than my temperament," Trump began. In his first jab at Hillary during the night, Trump said, "It's great to be here with a thousand wonderful people. Or as I call it a small, intimate dinner with some friends. Or as Hillary calls it, her largest crowd of the season." "I have no doubt Hillary is going to laugh a lot tonight. Sometimes even at an appropriate moment," he added. "This is the first time ever that Hillary is sitting down and speaking to major corporate leaders ... and not getting paid for it" - Trump was constantly at it. Taking a dig at the media houses in support of Clinton's campaign, and alleging that the media has been especially biased for this year's elections Trump said : "I know Hillary met my campaign manager. And I got the chance to meet the people who are working so hard to get her elected. There they are (pointing into the audience). The heads of NBC, CNN, CBS, ABC. There's The New York Times right over there and The Washington Post. There working overtime. True. True." Trump did however go on to display his fine sense of humour, referring to his wife's faux pas, involving her speech that was a complete rip-off of First Lady Michelle Obama's debut speech. "You know the president told me to stop whining. But I really have to say that the media is more biased this year than ever before. You want the proof? Michelle Obama gives a speech and everyone loves it. It's fantastic. They think she's absolutely great. My wife, Melania ... gives the exact same speech ... and people get on her case! I don't get it. I don't know why," he said. "Hillary is so corrupt that she got kicked off the Watergate Commission. How corrupt do you have to be to get kicked off the Watergate Commission? Pretty corrupt," began Trump's political attacks on Clinton. After Trump had finished firing his rounds, Clinton took the helm, taking a break from her 'rigorous nap schedule'. "But for me, it was kind of ironic thinking about a fiery populist, Al Smith. If he were here today and saw how much money we've raised for needy children, he'd be very proud And if he saw this magnificent room, full of plutocrats celebrating his legacy, he'd be very confused," starting off with a reminder of the cause for which the charity gala was being held. "You (Cardinal Dolan) were criticized for inviting both me and Donald here tonight. And you responded by saying, 'If I only sat down with those who are saints, I'd be taking all my meals alone.' Now, just to be clear, I think the cardinal is saying I'm not eligible for sainthood. But getting through these three debates with Donald has to count as a miracle. So, I guess I'm up against the highest, hardest stained-glass ceiling," she piped in. 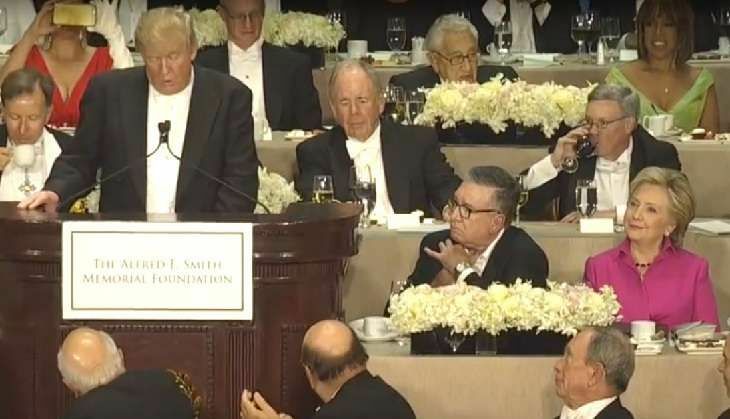 "And you know because this is a friendly dinner for such a great cause ... Donald, if at any time you don't like what I'm saying, feel free to stand up and shout 'Wrong!' while I'm talking," she said, making it clear that she had some punches up her sleeve reserved for her opponent. Taking a dig at Trump and his deplorable approach towards women's rights and women in general, Clinton said: "People look at the Statue of Liberty and they see a proud symbol of our history as a nation of immigrants, a beacon of hope for people around the world. Donald looks at the Statue of Liberty and sees a '4'. Maybe a '5' if she loses the torch and tablet and changes her hair." "People say, and I hear them, I know, they say I'm boring compared to Donald. But I'm not boring at all. In fact, I'm the life of every party I attend ... and I've been to three," not hesitating from indulging in some self-deprecating humour. "We've now had our third and, thankfully, final debate. Sharing a stage with Donald Trump is like ... well, nothing really come to mind. There is nothing like sharing a stage with Donald Trump. Donald wanted me drug tested before last night's debate. And I tell you, I am so flattered. Donald thought I used some sort of performance enhancer. Now, actually I did. It's called preparation," she added, once again packing a solid punch. She then goes on to summarise how historic this election is going to be, saying "We'll either have the first female president or the first president who started a Twitter war with Cher." Clinton touched upon Trump's proposed Muslim ban, saying Barack Obama would not feature in the annual President's day photo, as he wouldn't get past the ban. "Donald really is as healthy as a horse. You know, the one Vladimir Putin rides around on," she said, with a clever jibe at Trump's relations with the Russian President.